A quiet pool near the headwaters of the Brook. The Wahminda Grove Bushcare Group is rehabilitating the upper reaches of Kedron Brook where it runs through Samford Conservation Park (formerly Brisbane Forest Park). The site is accessed off Samford Rd, just west of Ferny Grove near the Wahminda Scouts and Guides Halls in Wahminda Park (UBD Map 117, ref. F17). It lies in the vicinity of several popular recreational areas, with Maureen Lawrence Park located just west of the work site, and Lomandra and Ironbark Gully Picnic Areas situated on the opposite side of Samford Road. 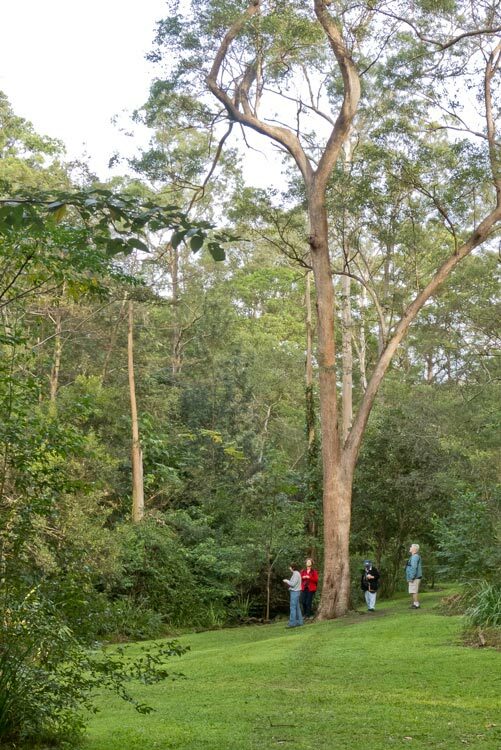 The site has become a popular choice for a stopping point in the Kedron Brook Catchment tours, particularly for the natural atmosphere enjoyed within the edge of Brisbane Forest Park. 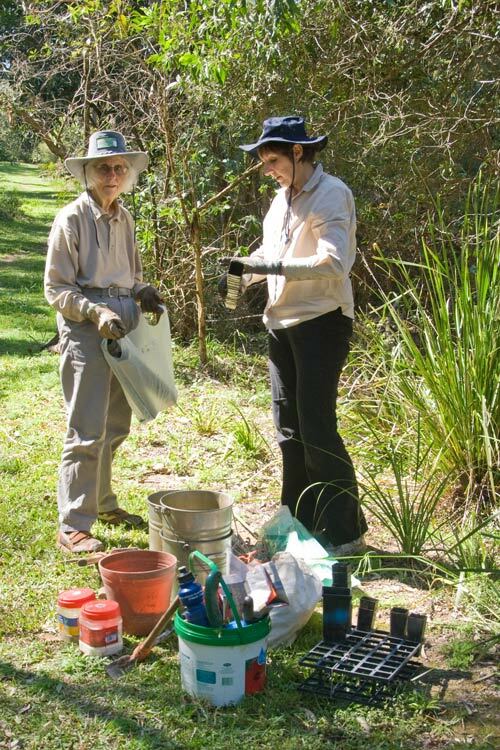 A number of bushcare groups are engaged at various locations along Kedron Brook, but this work area is the closest to the source of the Brook. The site is unusual in that, at this location, the creek forms the boundary between Brisbane City (BCC) and Moreton Bay Region (MBRC). The name of the group reflects both regions, with ‘Wahminda’ taken from Wahminda Park (MBRC) and ‘Grove’ from Ferny Grove (BCC). 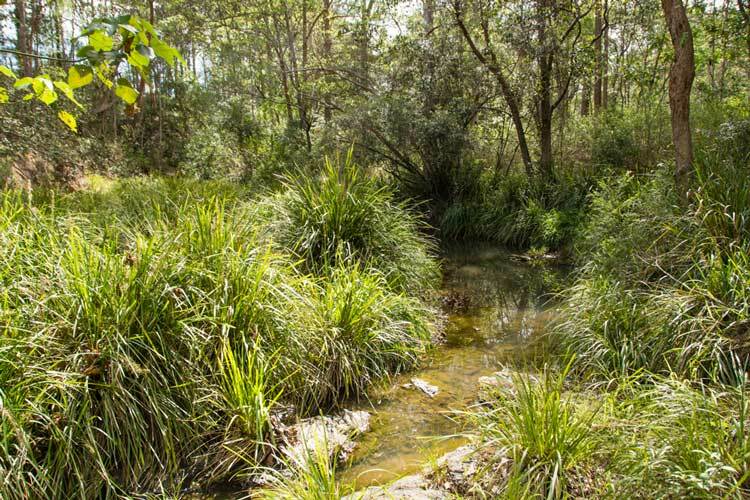 Bushland rehabilitation has been undertaken on the Council-owned Reserves along the creek bank on both sides of the waterway. The inaugural working bee was held on 28 July 2001, with the formation of the group initiated by Lyn Lutz and supported by Brisbane City Council based on a five-year plan submitted to BCC by Lyn for rehabilitation of a section approximately 750 metres in length along the Brook. 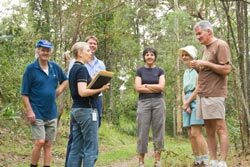 About a year later the leadership role was passed onto Ray and Di Loughrey, who at the time were also responsible for heading up another Bushcare Group at Dawson Parade, Arana Hills. Subsequently a working relationship was also established with the former Pine Rivers Shire Council (now MBRC), and both Councils continue to support the group with the supply of equipment, plants, advice and training. At the beginning of 2011, the leadership baton was passed onto Lyn and Ann Ellerman. 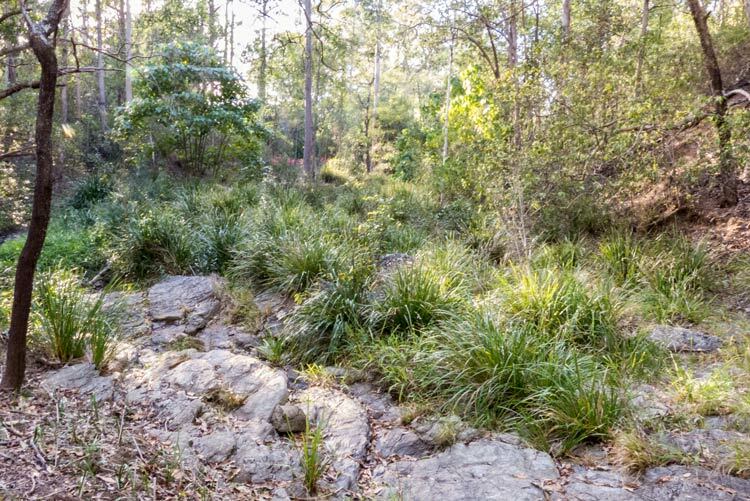 A significant variety of native vegetation still exists in this part of Kedron Brook, albeit covered in most parts by exotic plants. Despite the weeds, it is a beautiful natural area and the region is well worthy of restoration. In the areas where the weeds (particularly Lantana) have been removed, the native flora has re-established itself through natural and assisted natural regeneration. 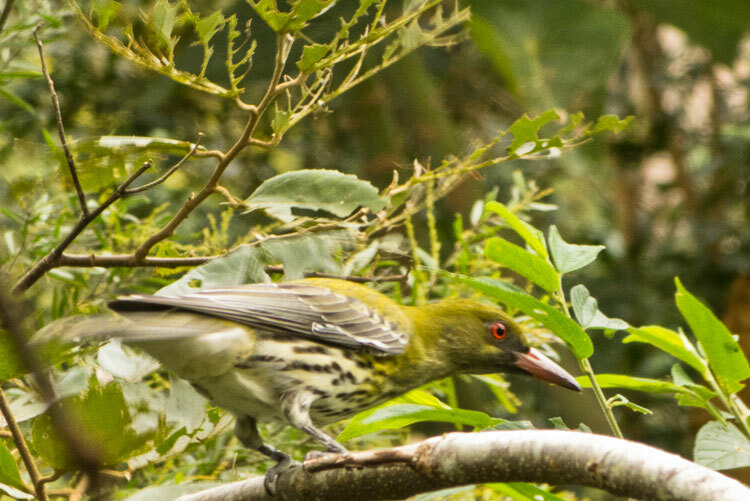 The area supports a wide variety of native birdlife, with an increase in numbers and species observed over the years as the native vegetation and habitat has been restored. To date, over sixty different bird species have been identified. It is now common to hear Whipbirds calling during working bees. In addition, sightings of large lizards such as Water Dragons and Goannas occur, with Green Tree snakes and Carpet Pythons seen quite regularly. Also, encouragingly, Koalas still exist in this area. Large areas of the site were once dominated by Lantana, with numerous other weeds such as Ochna, Guinea Grass, Cobblers’ Pegs, Easter Cassia, Wild Tobacco, Asparagus Fern, Ageratum, Mistflower and Mother of Millions also in abundance. Sadly many other escaped garden plants have invaded the area over the years as a result of irresponsible dumping of garden waste. Most threatening of all the exotic plants that have to be dealt with are the aggressive, invasive vines prevalent in the area such as Glycine (Neonotonia), Madeira and Velcro Vine. Over the years the weather has provided many challenges, particularly the long periods of drought followed more recently by weather turbulent years marked with violent storms and floods which caused major damage to trees and severe bank erosion. During times of heavy rainfall, erosion problems are exacerbated by the impact of stormwater feeding into Kedron Brook from a residential area on the Ferny Grove side of the waterway. Lyn Ellerman on 14 September 2010. A discussion of funding for local projects. 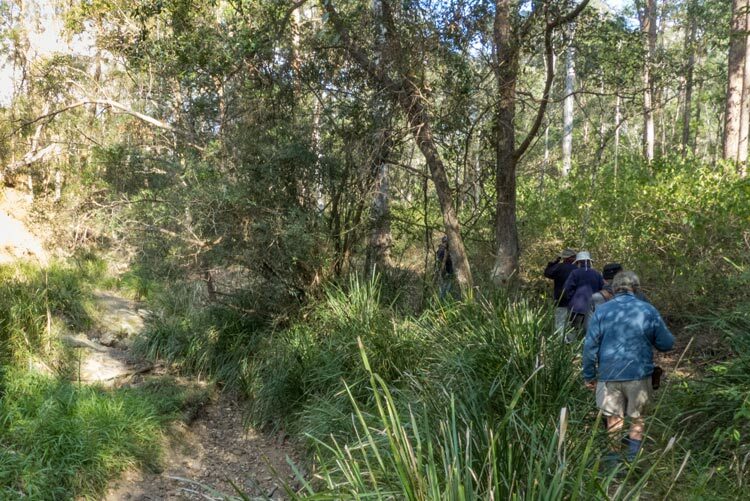 Despite these difficulties and setbacks, the group has had some major achievements, and is pleased with the progress that has been made in transforming significant sections of the site back to natural bushland. 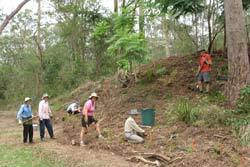 The primary activities of the group involve the removal of weeds and rubbish, and planting of indigenous native species. In the early days this rubbish even included a car body. 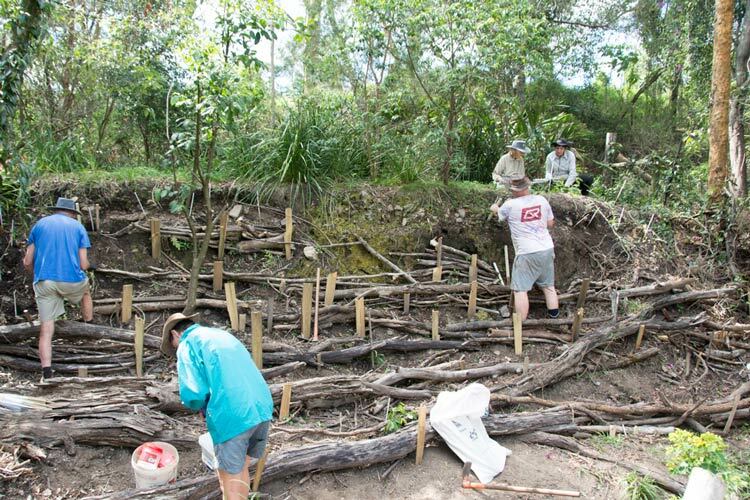 Lantana cleared from areas marked for revegetation is recycled and used as effective mulch, and also for building wigwams, structures that provide protected hideaways for small birds when their former cover has been removed. Stabilisation of the creek bank is a priority, and large trees along with hundreds of the native Mat Rush (Lomandra) have been planted along the creek bank to reduce erosion. Over the years the creek crossing has been cleared and a pathway lined with Lomandras has been created. This is now part of a popular walkway through the area for recreational use. 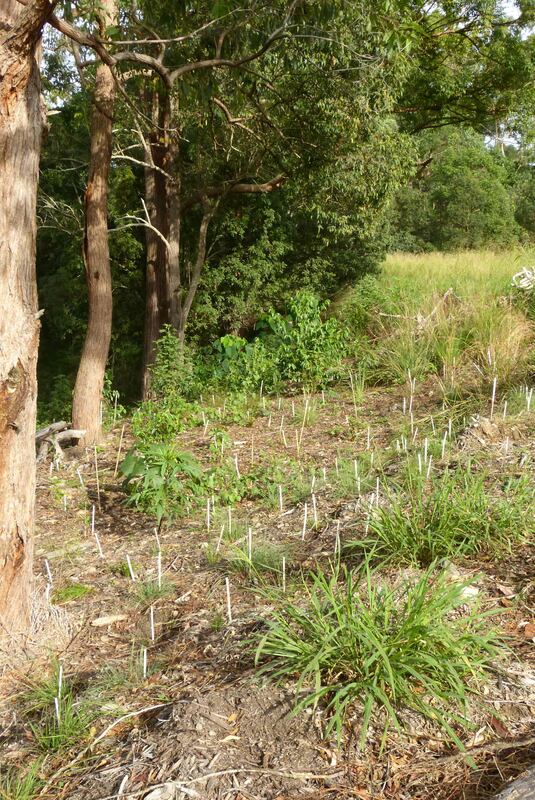 Assisted revegetation has been undertaken with the planting of hundreds of native plants, many of which have been propagated by members of the Bushcare Group. Specific butterfly host plants and food and habitat plants for bird and other wildlife have been a priority in the restoration efforts. In addition to the activities conducted on public land, the Wahminda Grove Bushcare Group is also responsible for a large bushland restoration project funded by Powerlink on the unusable portion of their Ferny Hills sub-station site. This privately owned property with creek-frontage on Kedron Brook is severely degraded and dominated by weeds (particularly Lantana, Japanese Sunflower, exotic grasses and invasive exotic vines) that are a constant threat to the adjacent revegetated sections of Council Reserve. The initial restoration of a section of the property along the top of the creek bank took place in late 2008 – 2009 under an informal arrangement with some financial assistance provided by Powerlink. Encouraged by the successful outcome of these activities, the company was approached for further funding to enable the Bushcare Group to expand the bush regeneration efforts to a much larger area. As a result, financial assistance for a 3- year project was obtained from Powerlink under their Community Awards Program. This financial commitment enabled major progress to be made over a short period of 3-4 months commencing in late 2011. Large scale weed treatment & eradication was carried out by an environmental restoration contractor & mulch was spread mechanically. 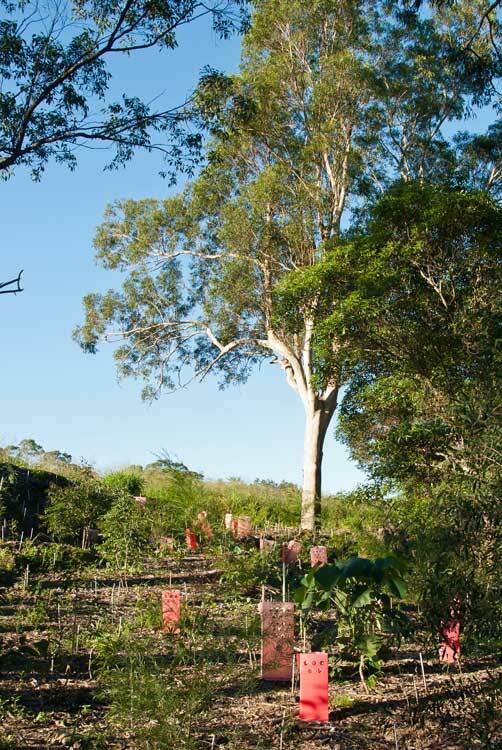 The Bushcare Group was able to commence planting the first stage of the project in February 2012, and planting sessions continued through to the end of 2013, taking the total number of plants used in the project to approximately 4000. The major activities in the final year of this project will be weed maintenance and control, coupled with in-fill planting as required. Transformation of the restored sections of this property from a weed-ridden eyesore to native bushland is occurring rapidly and demonstrates that major beneficial changes can be achieved by a small number of dedicated volunteers in a relatively short period of time. Full details of the Wahminda Grove - Powerlink Project are shown in the Projects and Funding section. We would like to extend our sincere thanks to the regular band of volunteers in the group and also would like to invite others to join us in this very satisfying activity. For further information, contact Lyn & Ann Ellerman phone 3351 1805.